On a walk in the neighborhood where I”m at right now, I discovered this magical fluffy tree. A friend told me it is called a Mimosa Tree! Check it out! Thanks for stopping by! Join the conversation and come back again. 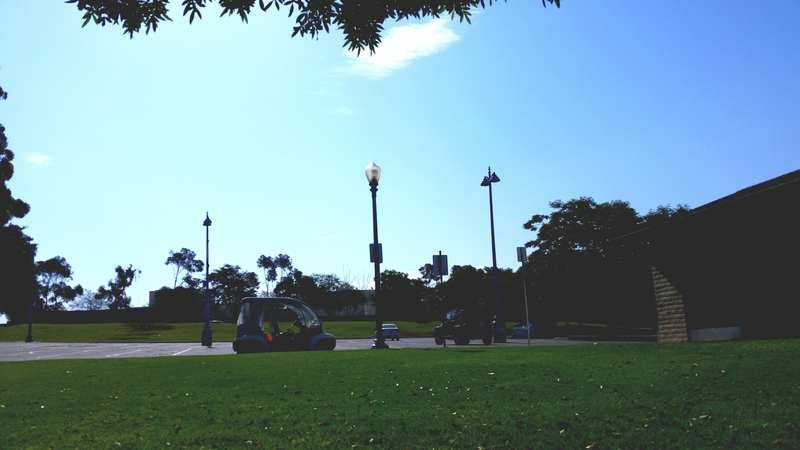 I had to drop a friend off to catch the train so decided to grab a scone and coffee and then head over early yesterday to Balboa Park Come join me on my day!!! I’d never taken a tour so decided to take the 11:00 am Ranger led tour. I had some time before that, so drove to the park behind the Fleet Science Center. I was amazed at how empty the parking lot was as I usually get there in the afternoon. Later when I was leaving, cars were circling the parking lot waiting for a space to open up. 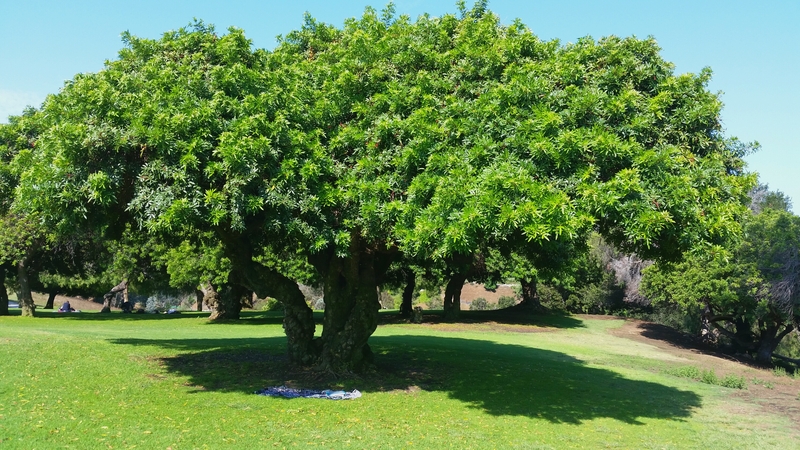 I pulled out my beach towel and sat underneath a nice big tree, and spent some time doing spiritual work. 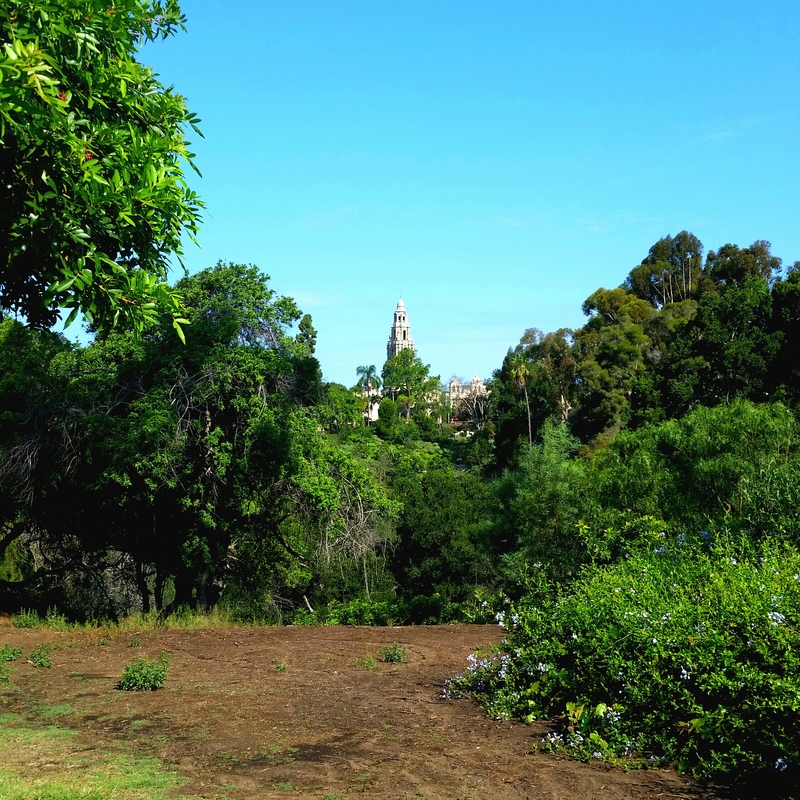 There was a nice view of the California Building Tower off in the distance. When it was getting closer to the tour start time, I decided to walk over early so I’d have some time to explore. 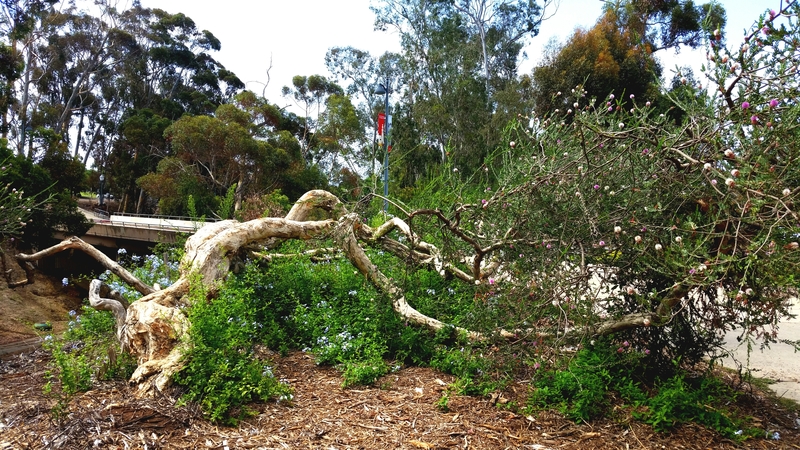 On my way between the building housing the Railroad museum and Zorro Butterfly garden, I saw this amazing tree that hadn’t grown up but rather sideways, almost lying on the ground. I met a woman from LA before the tour started, and later met her friend and we shared time together. So that was a nice surprise. I really enjoyed the tour. 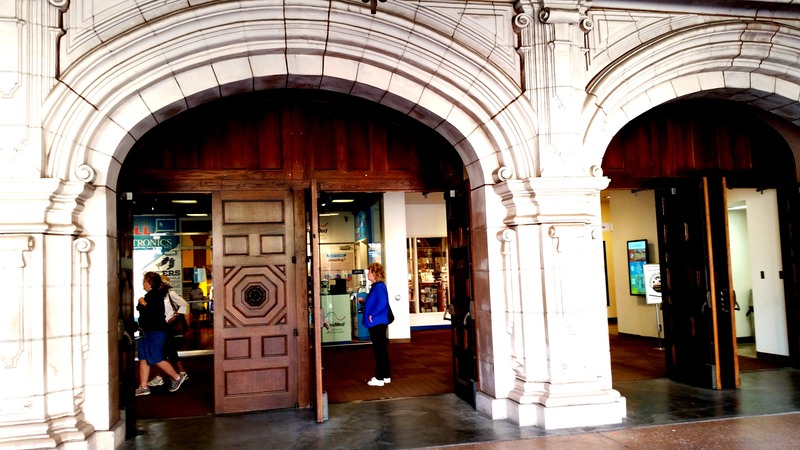 Although I’ve spent quite a bit of time in Balboa park and watched a video about its history, in the History museum, the tour added some interesting information. The tour guide was warm and informative. These tours are held at 11:00 on Sunday and Tuesday, meeting at the Visitors Center, in the Hospitality building. 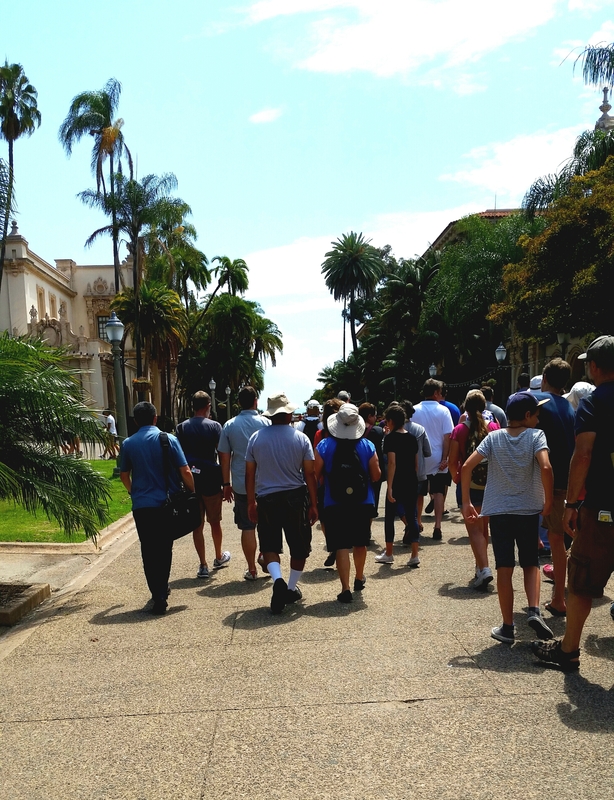 They also lead a botanical tour at 11:00 am on Sat. and an architectural tour on the first Friday, at 10:00 am. 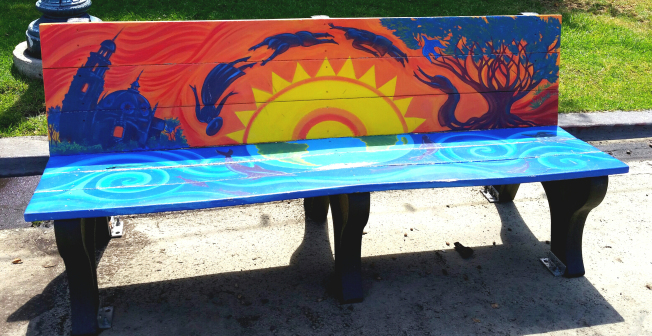 Before we left on the tour, I noticed this great bench in the newly redone Central Plaza. Here we are, heading out on the tour. 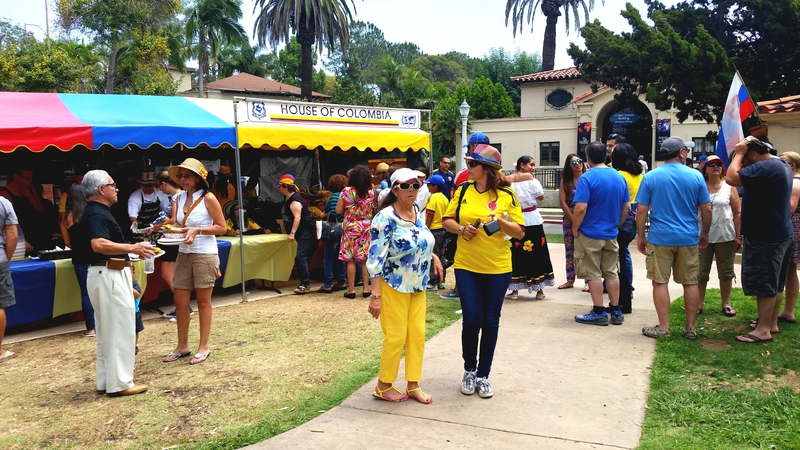 The tour guide explained that some of the present day buildings were built for the 1915 exposition and the 1930″s exposition and only built with temporary use in mind. So these buildings had to be torn down and rebuilt. The building housing the Railroad museum and other museums is hollow inside, and she explained that if you tap on the structure, you will hear it. She also explained that the busts near the top of the building have men’s heads and women’s bodies. I thought I had a picture of them but I couldn’t find it. Sorry. The building across the street from this one, the El Prado building that houses many offices and a great gathering of sculptures, is made of concrete, so it is more solid sounding if you tap it. On our walk I noticed the wonderful statues on the east side of the building. There are a couple figures that look like Native Americans. The park started as undeveloped land and the first plans drawn up were to leave it mostly that way, as an open park. It is larger than Central Park in NY. 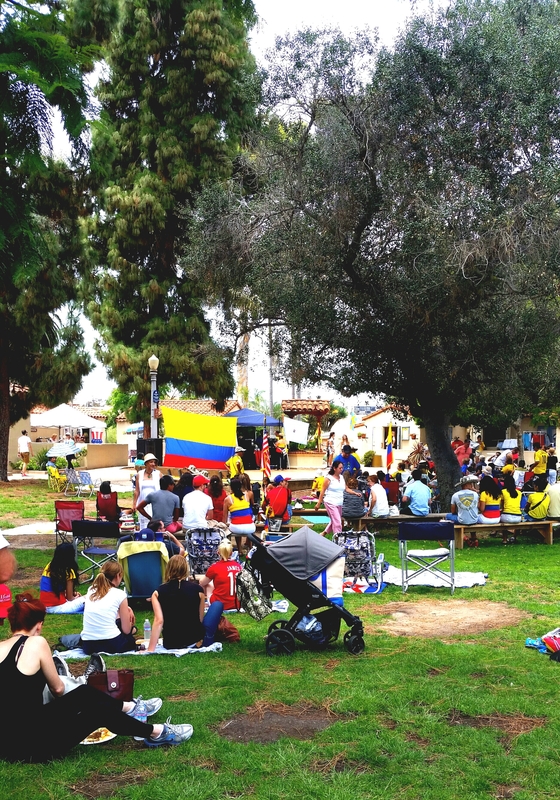 On the West side of Freeway 163, there are parks and stands of great trees. 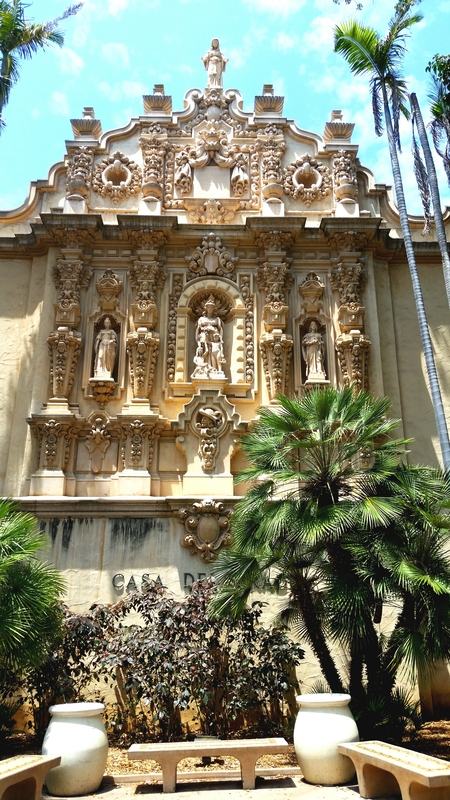 On the east side, east of Florida Street, is Florida Canyon. The guide relayed several interesting stories about its various uses before all the development of the park. There are many trails there now and various habitats to explore and east of that are more developed recreational facilities. Kate Sessions is responsible for helping expand the variety of vegetation and trees in the park, and especially for bringing in specimens from other countries. 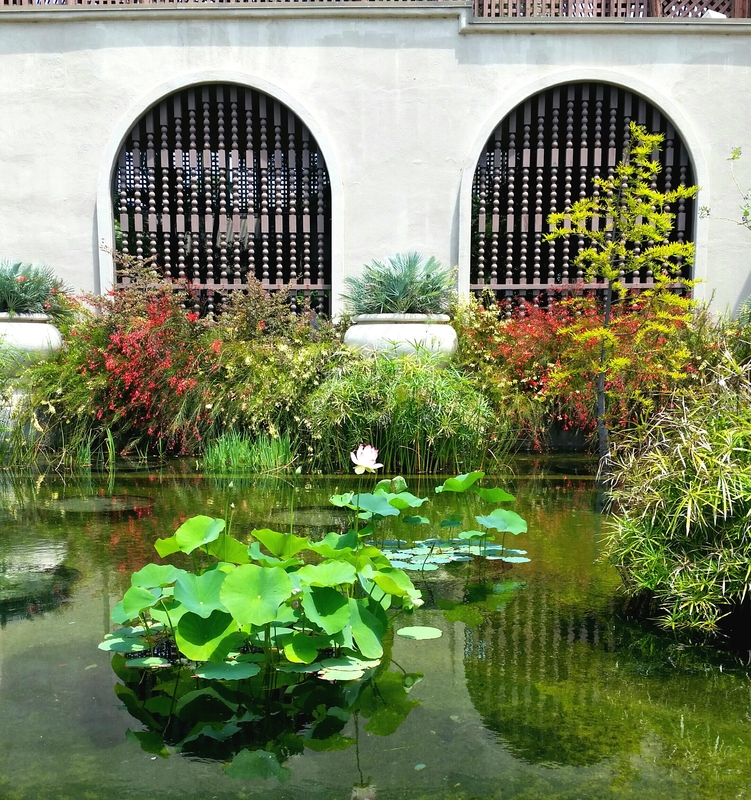 When we walked past the botanical building, I noticed lotus plants growing. 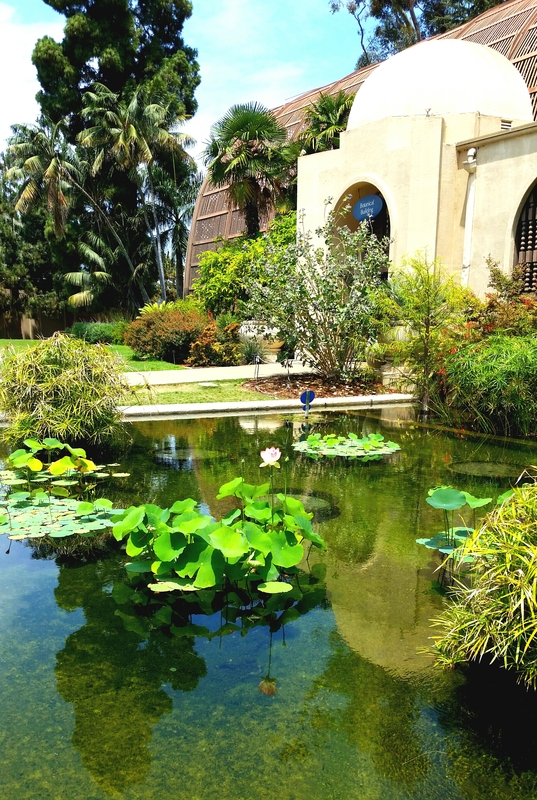 The guide told of a few disasters from the past, with others not respecting the delicate balance of the ponds. She shared that they’ve had people dump in catfish and other fish as well, which isn’t a great idea. 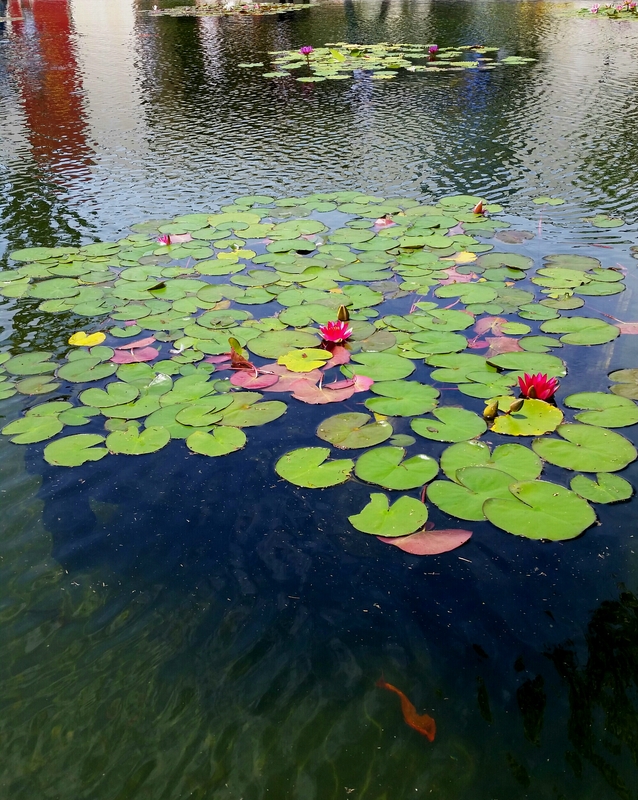 Here are some pictures of a tall growing lotus and some lotus on the pond. The lattice work on top of the Botanical Building is made of redwood. 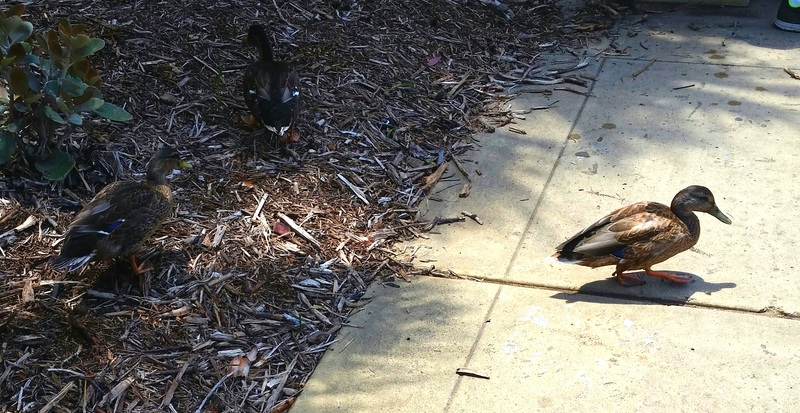 And some ducks wandering around. After the tour, the two women went with me to explore the hospitality houses. 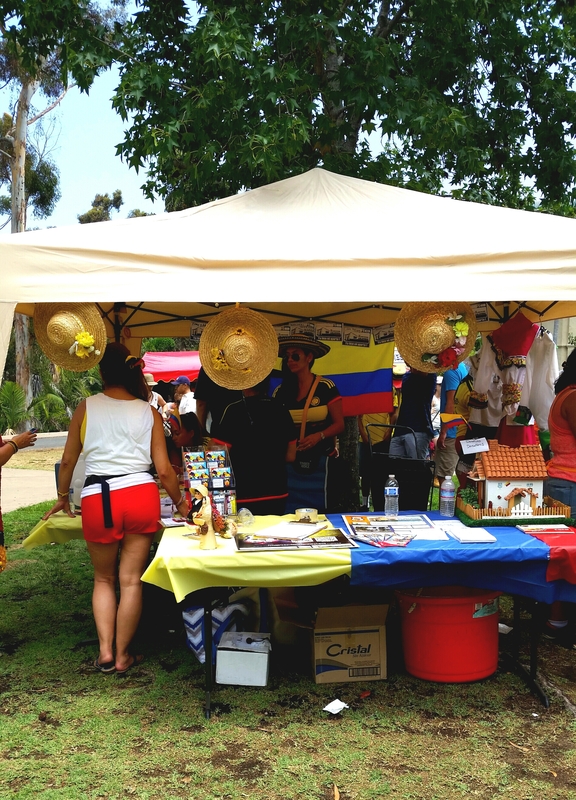 They were celebrating Columbia so there was a line up outside the food booth…. 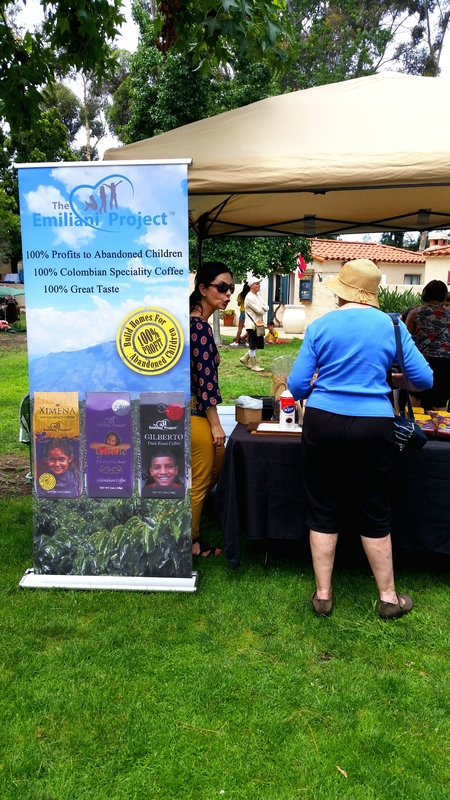 And a couple booths set up selling various products…. 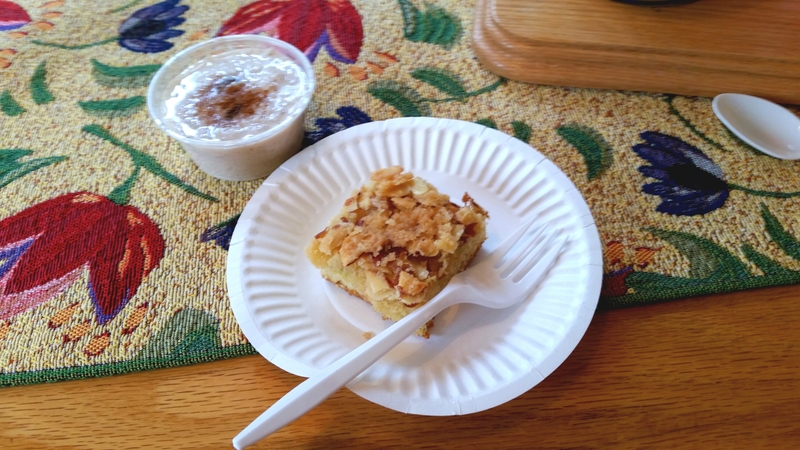 I bought some Arroz con Leche (rice pudding), from a Colombian booth and an almond cake slice from the German Hospitality house…. I left before the performances as it was too hot and sticky for me. 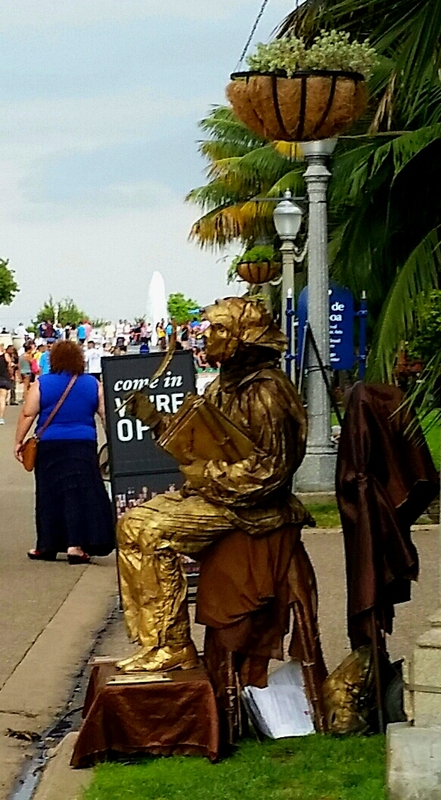 On the walk back, I passed this guy who is dressed up like a bronzed Shakespearean day performer. People pay to get their picture taken with him. And that concludes my walk. Hope you enjoyed it, especially since you got to stay cool while viewing it on your screen! Thanks for joining me. Thanks for reading and supporting my blog.